This was the first of the Vision Impaired tours organised by George Booth, with Erika and myself advising on how best to make the tour accessible for people who were blind or vision impaired. We Departed Perth on Singapore Airlines SQ226 at 3.50pm; Arriving in Singapore at 9.05pm. On arrival we were met and transferred to the Peninsula/Excelsior Hotel, our very well appointed accommodation for the tour. Breakfast at the Hotel and then we were off to explore the city; driving round the Civic District, passing by the Padang, Cricket Club, historic Parliament House, Supreme Court and City Hall. Stops at the Raffles landing site, a Chinese Temple in Chinatown, and we took a walk through the narrow streets and five foot ways in Chinatown with its myriad of stores selling clothes ,jewellery, antiques and souvenirs. Immersing ourselves in the fragrance of tropical orchids at the Orchid enclosure in the Botanical gardens. Lunch at Dim Sum Restaurant and then our Return to the Hotel . The night had our coach take us to dinner for Chinese Seafood at the Boat Quay. Greg and Erika enjoying a meal at Quay in Singapore. After Breakfast at the Hotel we spent the Morning at leisure doing some shopping. After lunch We set off on our tour to Sentosa Island to visit The Underwater World oceanarium which is home to 2500 fishes and 250 different species .Starting our tour with the touch pool and some hands on experience with starfish, stingrays and baby sharks. We move along an acrylic tunnel until we enterd the Dolphin Lagoon that houses the very intelligent Indo-Pacific Humpback Dolphin. returning to the Hotel at 8.30pm. After breakfast at the Hotel we met up with Cheng Hock. cheng introduced me to a taylor who measured me up for a suit. We took a ride on the MRT underground rail into the city center where we visited the famous Raffle’s Hotel for a Singapore Sling. 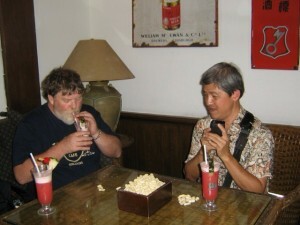 Greg and Cheng Hock sipping a couple of Singapore Slings at the Raffles. Breakfast at the Hotel and then we set out to visit the Changi War Museum and Changi Chapel. A most significant part of the 2nd World War history of Singapore. 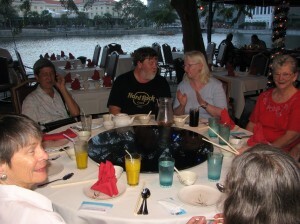 We visited Changi Village for a light lunch and then returned to the Hotel. That night we set out to explore the night life with a difference at the famous Singapore Night Safari; having dinner at the Ulu Ulu Restaurant befor we set out on the tram tour around the 40 hectares of nocturnal Zoo with 1000 nocturnal animals of 100 species all housed in the tropical rainforest. After breakfast at the hotel we spent the day walking the street and doing a little shopping. After breakfast at the Hotel we left for An early morning departure to join: Singapore Airlines SQ223 Departing at 9.30am, Arriving back in Perth at 2.35pm.